Brit melodic rock band United Nations have reformed after 30 years! There is a new album ‘2014’, which will be released in February on Steelheart Records. I remember buying their debut album on vinyl from Mike Lloyds record store in Newcastle and being mightily impressed. I had seen them live previously at Newcastle carnival and (I think) the Bridge Street Arts Centre in Newcastle. They did record a follow-up album which never got released and sadly they never got the exposure and success they deserved. Fast forward thirty years and they are back with a good choice of vocalist in Lee Small. With the renewed interest in melodic rock hopefully they can get the recognition they deserve. 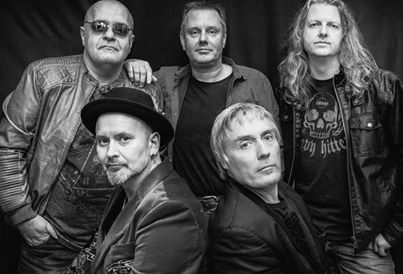 Original members Pete`Hank`Hankey (bass), Chris Stonier (keyboards) and Chris Mooney (drums), are joined by newcomers vocalist Lee Small (SHY/SNOWFALL) and guitarist Neil`Fred`Thomas. They play their first reunion gig at Our Bar, Stoke-on-Trent on Feb 22nd. This entry was posted on December 30, 2013 at 7:35 pm and is filed under AOR, Classic rock, Melodic rock with tags Lee Small, melodic rock, rock, Stoke-on-Trent, United Nations. You can follow any responses to this entry through the RSS 2.0 feed. You can leave a response, or trackback from your own site.